These treats are quick and easy! I make my own oat milk, simply by adding 1 cup of oatmeal to 3 cups of filtered water in my food processor. 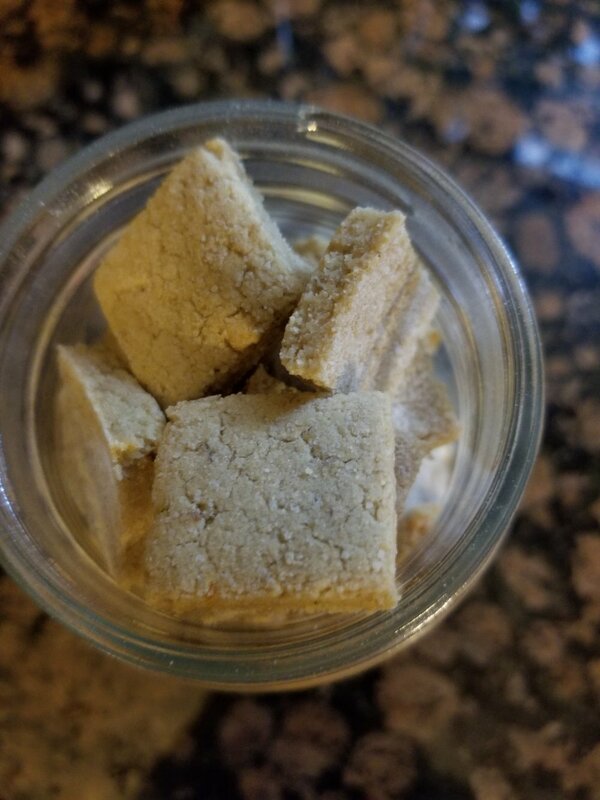 The oats that I strain out are still good for making dog biscuits, so each week, I have been coming up with a new recipe based on what I already have on hand. Use ingredients you have on hand! Generously flour your baking sheet with rice flour. Roll your dough to 1/4” thick. I prefer a wine bottle because it rolls over the edges of the sheet. Sprinkle the top of the dough if it sticks too much while rolling. Then, score with a knife. Bake on 350 F for 30 minutes, then turn the heat down to 200 F and bake for an hour. Turn off oven, and let the treats stay inside until the oven has cooled. This will help the treats to dry out further without burning. Store any treats that won’t be used immediately in the refrigerator or freezer. Alternately, these treats work well in a food dehydrator overnight, on the lowest setting. More holistic, grain-free treat recipes are available in my hardback cookbook or the digital downloaded version. It’s kind of annoying when you look for a recipe, and the blog that features it has this entire diatribe before the recipe is posted. Not so here! Recipe adapted from one posted by Monica Segal. Just mix everything together. It will be a wet ball of dough when mixed. 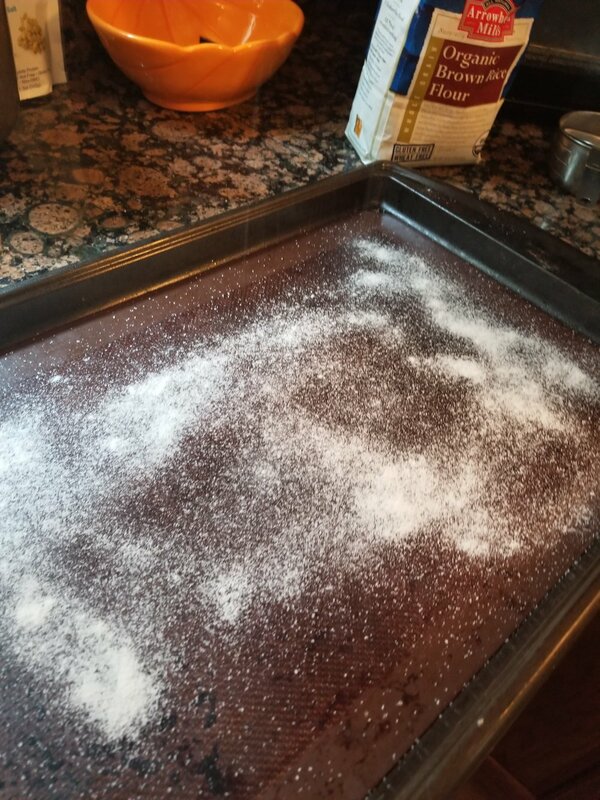 Generously flour your baking pan and mat with additional rice flour. Roll out dough, using extra rice flour where sticky, to about 1/4” thick, then score with a knife. Bake at 350F for 30 minutes, then drop temp to 200F for 60 minutes. Just leave the pan with the treats on it in the oven until it’s completely cool, when finished. This will help dry them out a little further. Alternately, these treats work well in a food dehydrator overnight, on the lowest setting. I recommend they stay refrigerated because there are no preservatives, though they probably won’t last long enough to grow mold anyway…more holistic, grain-free treat recipes are available in my hardback cookbook or my digital downloaded version. My holistic pet treat cookbook contains recipes written and tested by yours truly. 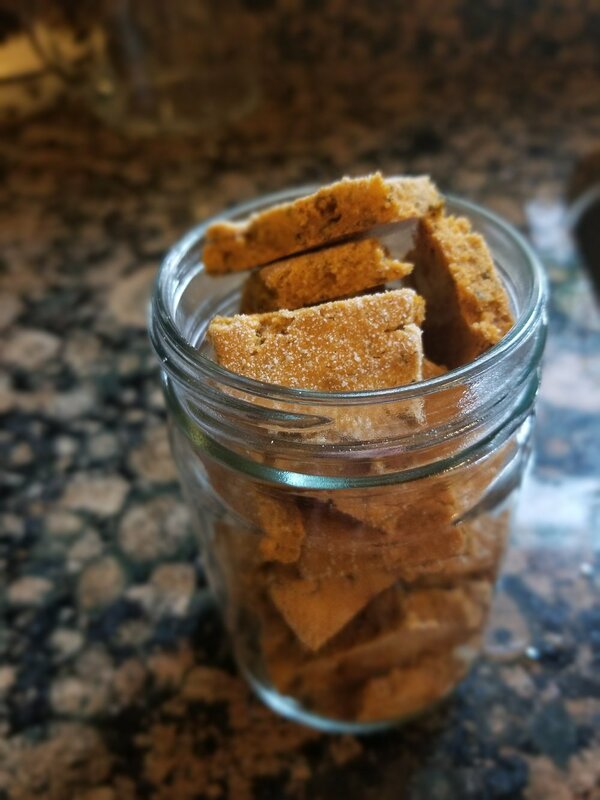 Check out this video I created, which shows you how to make healthy, grain free dog treats in your own kitchen, very inexpensively.